Don't you just hate it when you break a nail? What a disaster! If a nail breaks by accident, it's okay. Accidents happen. However, if your nails are constantly breaking, splitting, peeling or chipping, then you have a problem. You must take care of your nails diligently and with great patience — strong, beautiful nails do not happen overnight. 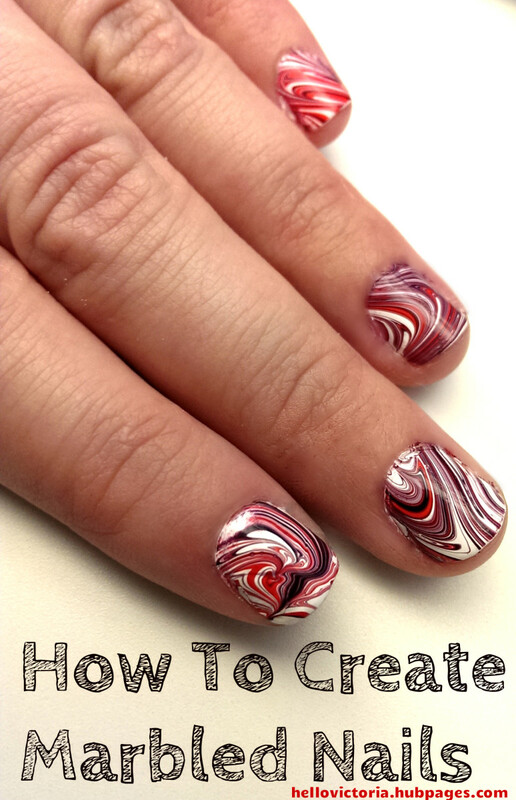 By following the simple tips outlined below, you can have the nails that you have always dreamed of. 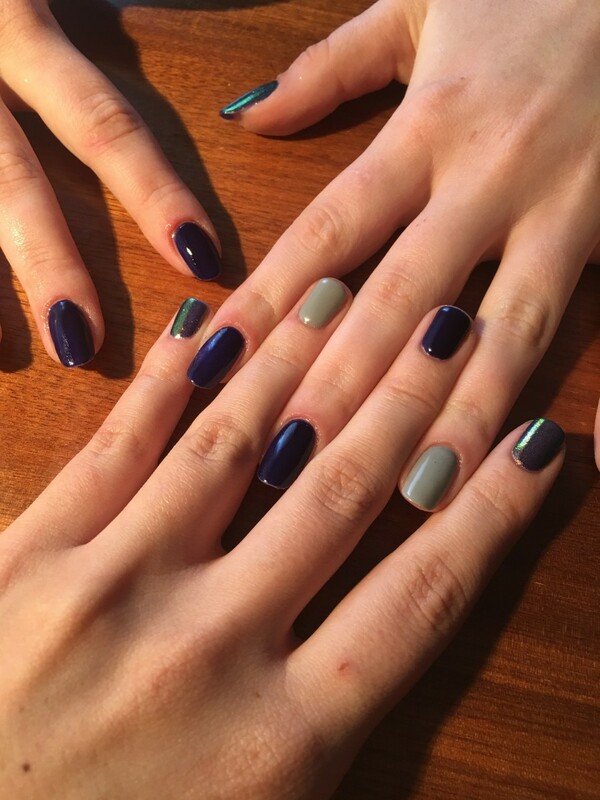 To have beautiful hands, you have to have beautiful nails. To have beautiful hands and nails, you have to keep them clean. Wash your hands with gentle hand soap and use a nail brush to scrub your nails thoroughly on top, along the folds, and under them where dirt usually hides. 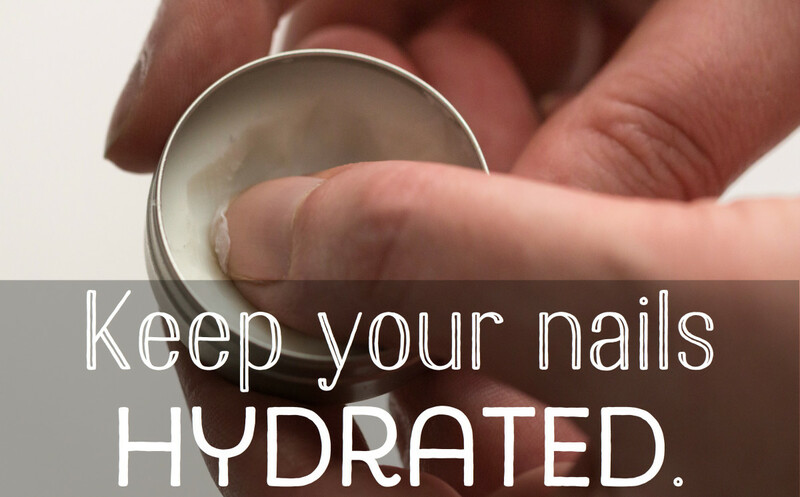 Water hydrates your skin, but dehydrates your nails. To compensate, you need to moisturize your hands and nails after every wash. Your regular hand moisturizer will do. As you're rubbing your hands together, make sure your nails are being thoroughly moisturized as well. Gloves Are Your Nails' Best Friend! 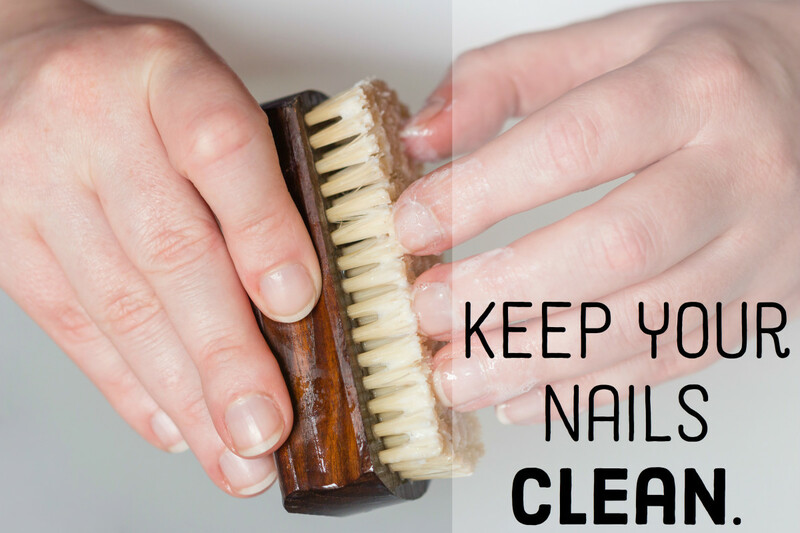 Not only is this common chore tough on your hands, it is also very damaging to your nails. Excessive dish washing is one of the most common reasons that nails become dry and brittle. If you have a dishwasher, use it. 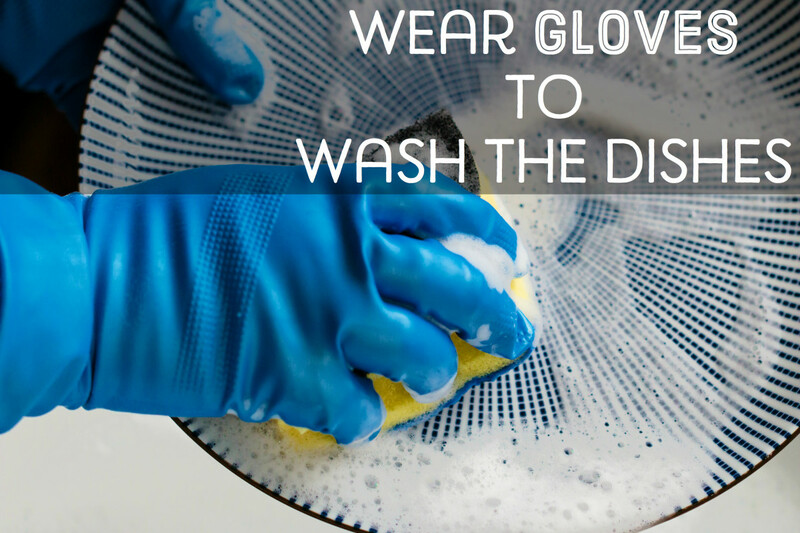 If you have to wash the dishes by hand, protect your nails by wearing rubber gloves. You also shouldn't forget to protect your nails when doing other household chores. Harsh chemicals from soap and cleaning products are murderous to your nails. Wear latex gloves with a cotton lining to protect your hands and nails when cleaning your kitchen or scrubbing the bathroom. Gloves also go for outdoor chores! Protect your nails from dirt and breakage when you are working on your garden. You should never work on your garden without garden gloves. In addition to keeping the dirt off your nails, garden gloves also protect your hands from blisters, sharp objects, and thorns. Water, harsh soap, and other cleaning products dry out our nails. In addition, our nails get drier as we age. To make up for the loss of water, we need to moisturize our nails regularly to prevent breaking, splitting, and chipping. To keep your nails hydrated, moisturize your hands and nails after every wash. You can also rub a small amount of petroleum jelly on your nails after bathing or showering, and every time you wash your hands. Shea butter, jojoba oil, avocado oil, castor oil, and olive oil are also great for keeping your nails hydrated. Be careful of using manufactured nail moisturizers since these products may contain alpha-hydroxy acids, lactic acid, and urea, substances that can cause stinging and contact dermatitis in some people. Applying nail polish, even if it is just a clear base coat, protects your nails and reduces moisture loss. A proper nail polish application consists of a base coat, one or two coatings of your chosen nail polish, and a topcoat. The base coat is important to ensure good adhesion to the nail plate and prevent the polish from chipping. The base coat may also prevent nail discoloration caused by dark polish. The topcoat provides gloss and resistance to chipping. Note: Nails don't need to breathe! Since nails are made of keratin, they don't require oxygen and do not need to "breathe" the way your skin does. Nail polish removers may contain strong solvents such as acetone, alcohol, ethyl acetate, or butyl acetate, all of which are harmful to your nails. Conditioning nail enamel removers are available, but their effectiveness is minimal compared with the dehydrating effect of the strong solvents required to dissolve the nail polish. It is not advisable to use nail polish remover too often. Once a week is more than enough. Nails are made of layers and their natural oils are the glue that keep layers together. 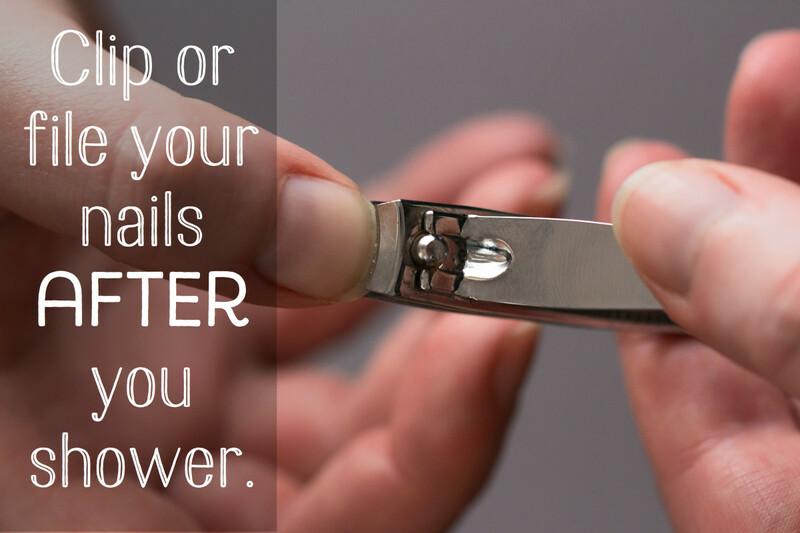 Clipping or filing dry nails will cause your nails to split and separate. The best time to clip or file your nails is after a shower or bath or after washing your hands, when your nails are softer and less likely to split or break. File your nails only in one direction. Filing your nails back and forth will cause your nails to split. Long, pointy nails tend to break easily when doing daily activities. Short-to-medium length nails with well-rounded tips have the least chance of breaking. Nail hardeners are used to increase the strength of brittle nails. However, dermatologists do not recommend using them since they may contain toluene-sulfonamide-formaldehyde resin, which will actually cause your nails to become even drier. It should be noted that nail hardener labels claiming "formaldehyde-free" may still contain formaldehyde, since formaldehyde in concentrations of 1-2% is still permitted by the Food and Drug Administration. Never cut or remove your cuticles, as this can cause inflammation and infections. Just push them back gently. Before pushing your cuticles back, however, you should take a shower or soak your fingers in lukewarm water for 10 to 15 minutes to make sure the cuticles are soft and pliable. 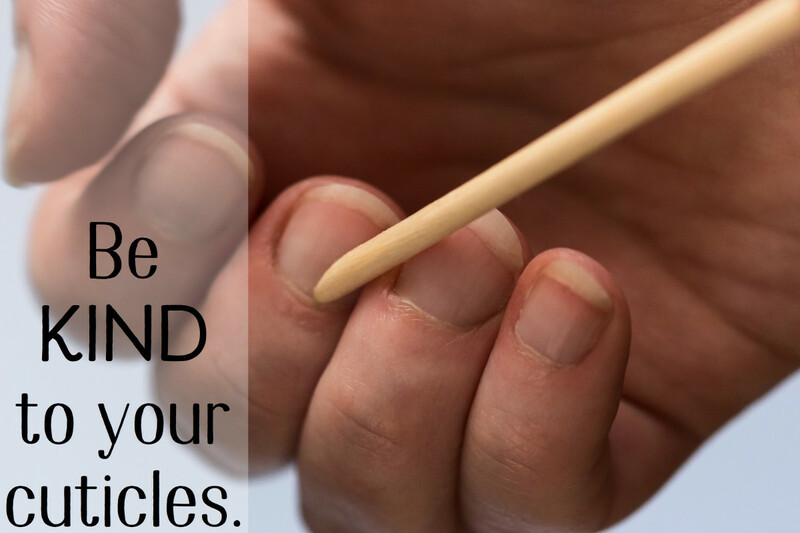 With a cuticle stick (wood is gentler to your nails than steel), gently push your cuticle back. Be careful not to damage it, as damage will weaken the entire nail. Remove the dead cuticle by moving the cuticle stick in a circular motion around the base of your nail. Cuticle removers are formulated as liquids or creams that contain an alkali to destroy cuticle keratin. Since cuticle removers contain high alkali, irritant contact dermatitis is common if the product is left on too long. As mentioned above, the removal or manipulation of the cuticle is not recommended, as it may result in inflammation and infection. Cuticle removers can also damage the nail plate through softening. Use cuticle cream that contains citric acids, which are more effective moisturizers. You should choose moisturizers that contain petroleum, glycerin, shea butter or safflower seed oil. These natural moisturizers do wonders for your cuticles as well as your hands. Cuticle oil is your best choice. Cuticle oils are usually made of a combination of enriched vegetable oils, flaxseed oil or citric acids. The oil provides an intense hydration, allowing the cuticle to repair itself and reattach to the nail. Use more intensive treatment with vitamin E oil, which you can find in most drug stores. Shea butter, almond oil, or olive oil also works wonders on cracked cuticles. Just rub it in the cuticles like any other cuticle oil for the same results. Your nails are not always clean, so biting your nails is absolutely unhealthy. 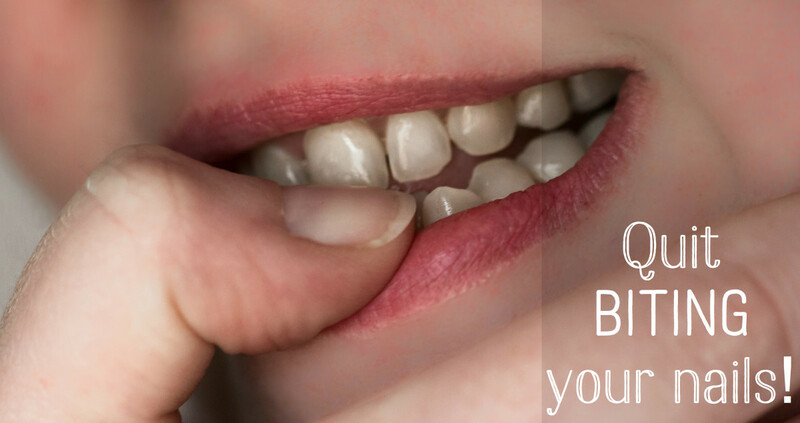 It is a bad habit that leads to split and choppy nails, bleeding, infections, and pain. Stop it! However, I know it's easier said than done. We all do it. 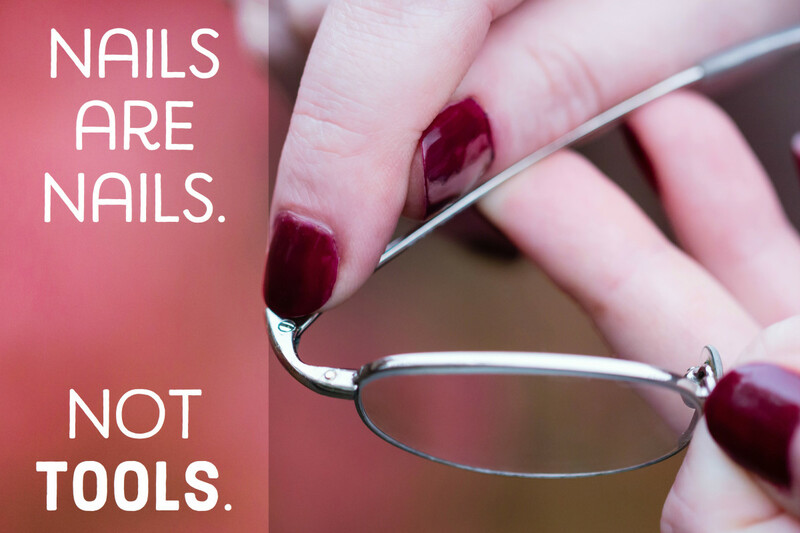 We use our nails as tools without giving it a second thought. We use them to open cans, scrape or remove stickers, and even scratch up dirt. We use them as scissors, screwdrivers, thumbtack removers, etc. All this misuse of our nails puts a lot of wear and tear on them. So, let's say it all together now: "Nails are nails. Not tools!" While water, acetone, and other harsh chemicals will make your nails dry and brittle, causing them to split, cold weather can also make this condition worse, especially when you go outside without warm gloves. 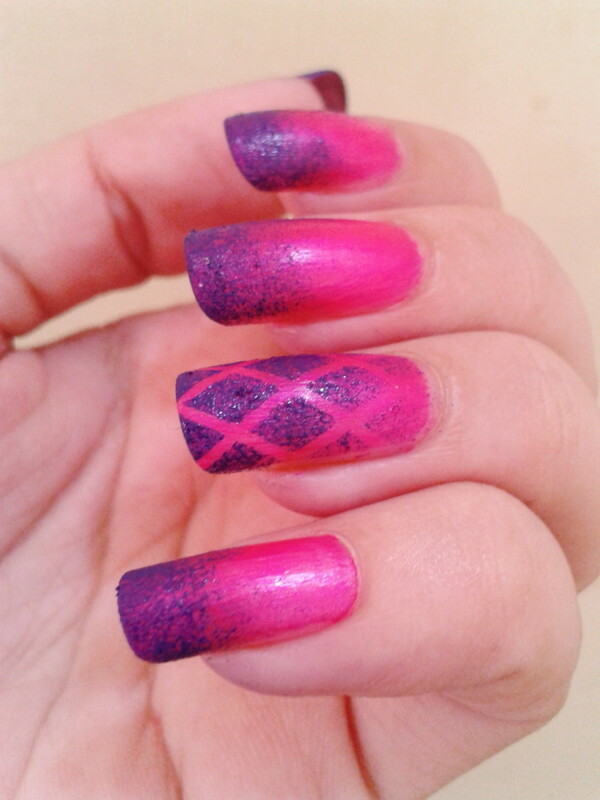 Nails are made of layers. In the winter, dry air permeates the layers, leaving them so brittle that even the slightest impact, like striking a computer keyboard, can cause them to break. 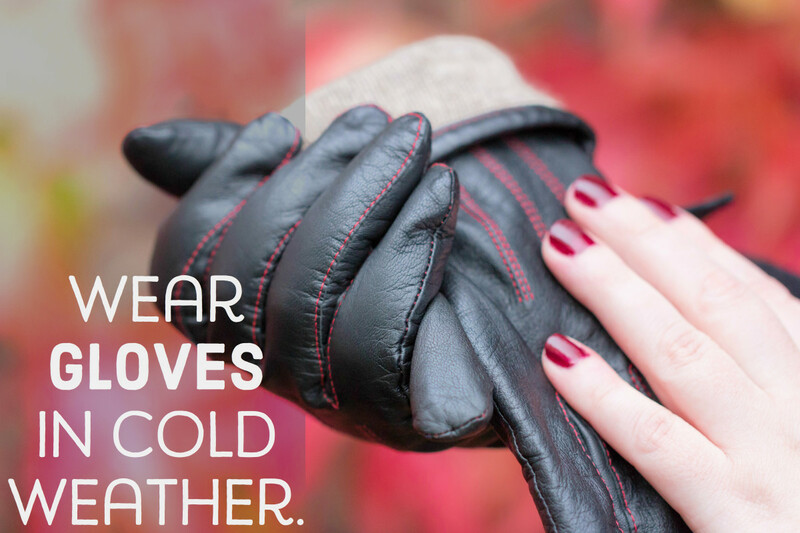 To prevent this, you should always wear warm gloves during cold weather. If nails were living tissue, then nails could just repair themselves when they break. But they are not. Nails are dead. They are made of layers of a protein called keratin, the same protein found in your hair and in the top layer of your skin. 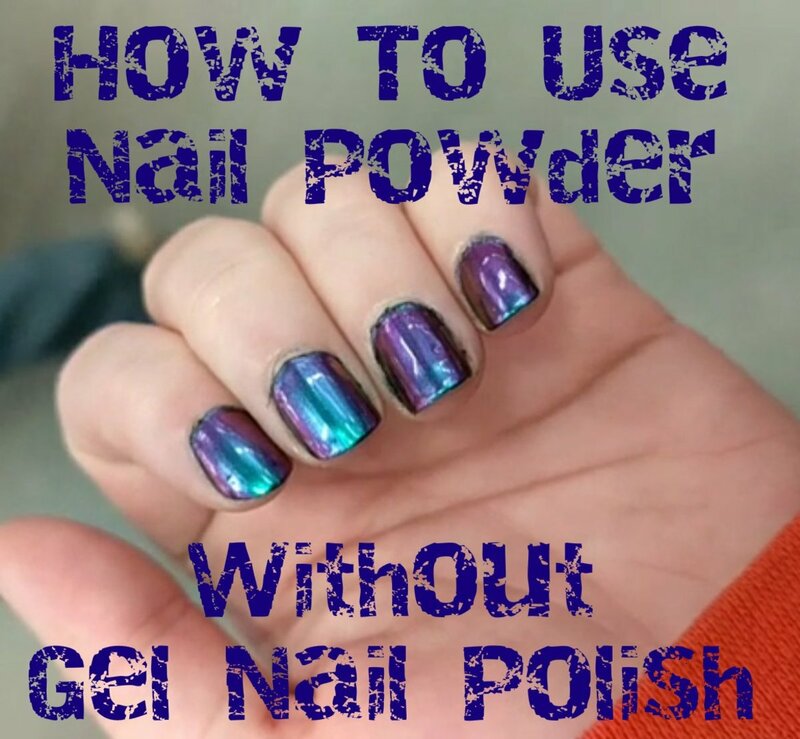 By the way, gelatin also does nothing to your nails. In general, you have to care for your nails from the outside. Proper nail care seems to help maintain nail health. No evidence supports the use of vitamin supplementation with vitamin E, vitamin C (ascorbic acid), vitamin A, retinoids, retinol, retinal, silicon, zinc, iron, copper, selenium, or vitamin B12 (Cyanocobalamin) for improving the nail health of well-nourished patients or improving the appearance of nails affected by pathologic disease. Brittle nail syndrome appears to abate with supplementation of a 2.5-mg dose of biotin daily or a 10-mg dose of silicon daily. 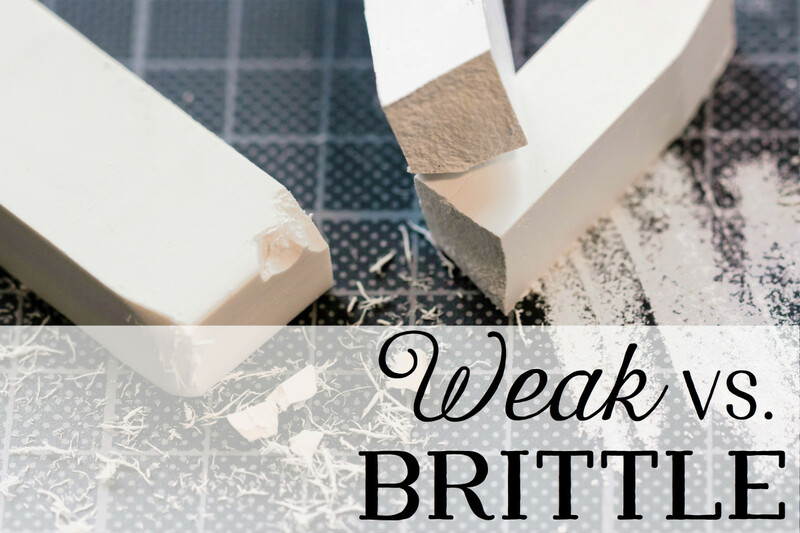 You might be interested to know that brittle nails are not the same as weak nails. 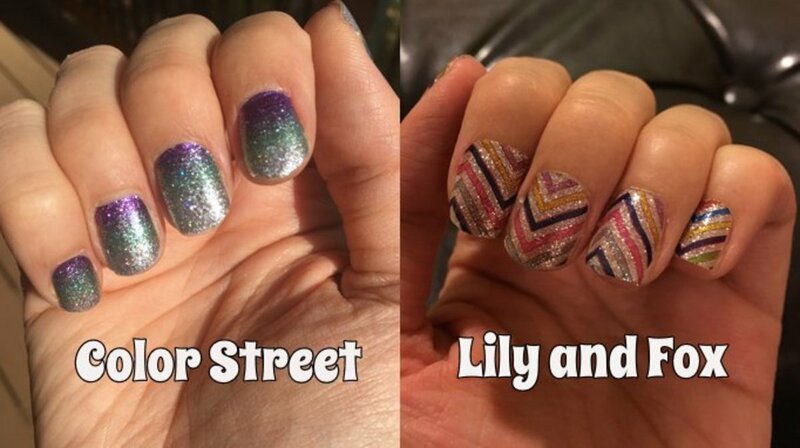 They are quite opposite, but both problems will cause your nails to break easily. Brittle nails are nails that are dry. The lack of moisture causes them to become too hard, making them break easily. This can happen when we wash our hands too often without moisturizing. Soap, cleaning products, acetone, and formaldehyde also dry out nails. Weak nails are nails that are too moist. The excess moisture makes your nails soft, causing them to tear easily. Though there are nail hardening products on the market, you should be aware that these hardening products contain ingredients like formaldehyde, and prolonged use of formaldehyde may cause the opposite problem: brittleness. Because of this, most dermatologists do not advise the use of nail hardeners. People who change their nail polish almost every day are more susceptible to nail damage because most polish removers contain acetone and formaldehyde. Older people also experience more nail damage because nails dry out as we age. Soak your nails in olive oil for 15 minutes a day for a month, and twice a week thereafter. This can help rehydrate and fortify damaged, peeling nails. Use a cuticle cream every night. Regular moisturizing can help reverse nail damage. Take a nail polish holiday. 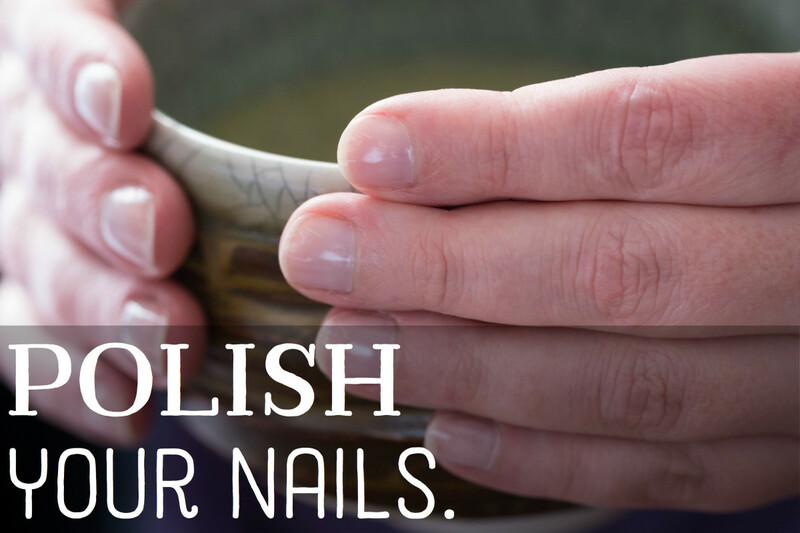 If you've tried precautions and are still suffering from brittle nails, try giving them a break and leaving them free of polish. All nail polish contains elements that dry out your nails, so giving them a rest (for about three months), might give them a chance to self-repair. Take biotin supplements. Adding more biotin to your diet might increase the thickness of your nails and hair (see above study). 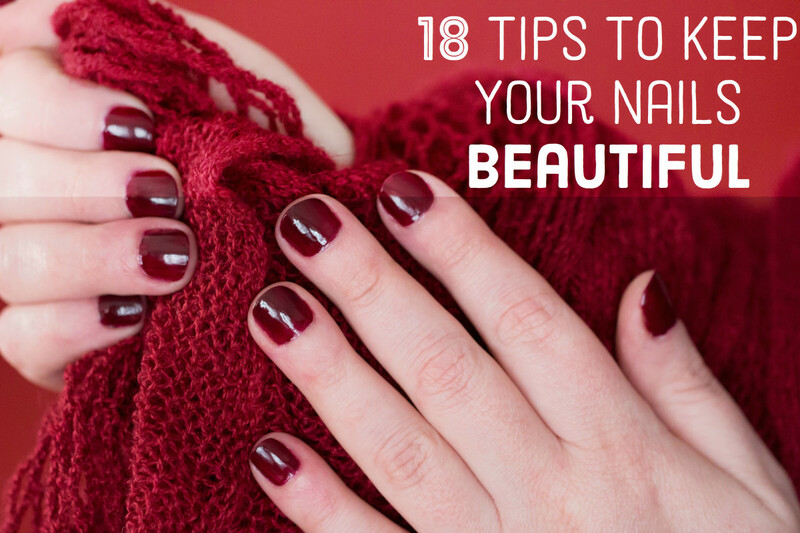 Give your nails lots and lots of tender loving care. If beautiful hair is the crowning glory of your face, having beautiful nails is the crowning glory of your hands. If you follow the above tips to prevent your nails from breaking or splitting, but the problem continues, go see your doctor. There might be some medical conditions behind it. Vitamins and minerals: their role in nail health and disease. Scheinfeld N, Dahdah MJ, Scher R. Source: Department of Dermatology, Columbia University Presbyterian Hospital, New York, NY, USA. Hiya Suzy sparks, you're welcome. I'm glad you found this hub helpful. I also learned why my own nails were breaking and splitting, while doing the research on nails. Cheers! Found some great tips in this hub that I'll try. Thanks a lot Rosie. Hiya Moonlake, I'm glad you found my hub on nails informative. Ouch! I also had some nails split down into the skin, and it really hurts when they get snagged. I usually clip the broken nail to avoid that. Thanks for the vote. Cheers! Really nice hub so much good information. My nails get very long. I can't put polish on them it will cause them to break. They split way down into the skin. Once that split gets high enough I have to put a bandaid on it to make sure I don't snag it on something because believe me it hurts if it gets pulled off. Hiya Crystal Tatum, thanks for dropping. I'm glad you found my hub on nail care useful and informative. I know what you mean.. for years I thought eating gelatin makes my nails strong and healthy. Now I found gelatin does squat to my nails. lol Cheers! Hiya AliciaC, thanks for dropping by and I'm glad you found my nail care hub useful. Cheers! Very useful and informative hub. 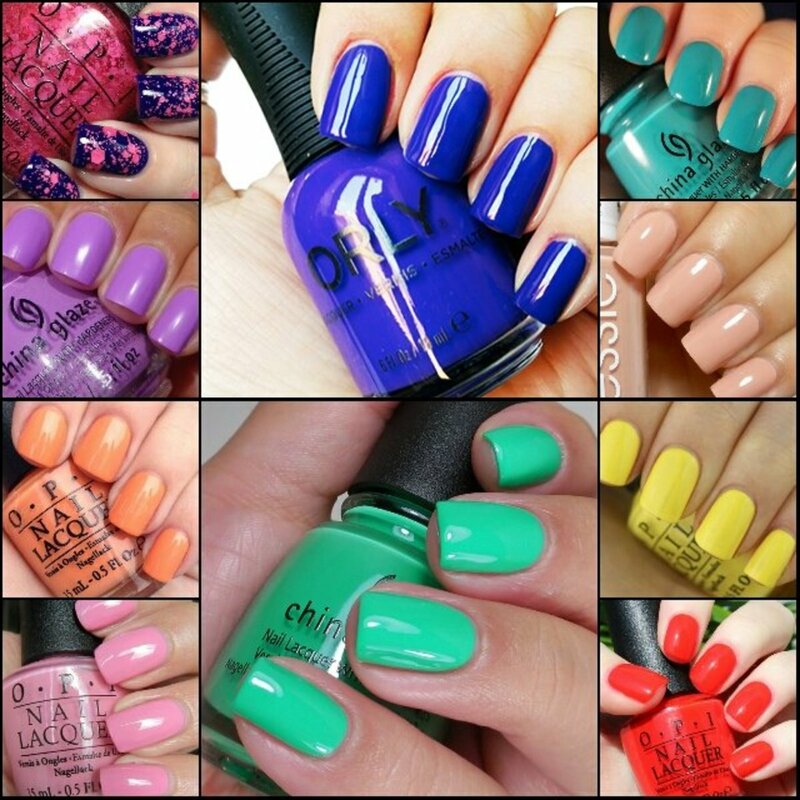 You debunked many claims I have heard over the years about nail care. Great job! Thanks for a detailed hub and for all the useful ideas for taking care of nails, Rosie. You're welcome, Helen. I'm glad you found my article on nail care helpful. Thanks for dropping by. Cheers! Thanks for all of the good tips Rosie! Hiya davenstan, it took a few days but finally I got it done. lol My nails are also breaking and splitting for no apparent reason. So I got interested in your question and did a thorough research about why nails are breaking or splitting. I'm glad you found out the answer why your nails are breaking. Mine is because I'm getting old.. ok I'm old. I'm glad you liked my hub answering your question, and thanks so much for sharing. Cheers! Wow! you really answered my question. I think my nail breakage problem is from washing my hand too frequently and not polishing them. Socially shared. Thanks for answering my question.